Look, who among us hasn’t indulged—no, relished—a stop at a drive-through? Fast food isn’t always a quick meal on the run; sometimes it’s a craving, and then it’s a destination. A handful of L.A. chefs not only know but embrace this, and are creating their own versions of the cheap-and-casual classics. Southern California is historically one of fast food’s greatest innovators, after all—so whether you’re fiending for the most iconic so-bad-it’s-good dishes without the guilt or you’re a fast-food die-hard wanting to see how these spins stack up, here’s where to find gourmet takes on drive-through stalwarts. McDonald’s didn’t invent eggs on a sandwich, but by god, bargain breakfasters the world over would argue they perfected it: a fluffy egg patty, some sausage, cheese and a little griddle grease and you’re good to go. In Santa Monica, chef Miles Thompson is bringing his take to the table at Michael’s, and he’s doing it for a great cause. Thompson’s limited-run creation launches today and the proceeds from the $10 price tag benefits the Malibu Canyon Ranch farmers affected by the Woolsey Fire. It’s called the MikeGriddle, but is anything but a carbon copy of the McGriddle sandwich (a stack of egg, American cheese, bacon or sausage and maple-flavored pancake buns). The Michael’s spin includes a meaty house-made rabbit sausage patty topped with a Japanese tamago-style egg disk and sandwiches both items between Brazilian cheese bread. Heads up: The item is only set to run through Thanksgiving week, though it might stick around longer. 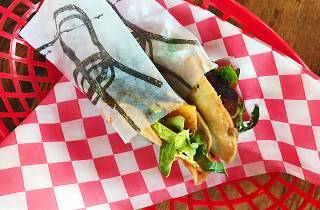 Jack in the Box tacos are almost a rite of passage in California: Served since the 1950s, natives grew up around them, and to this day, modern Angelenos, too, know the siren song of the greasy, two-for-99-cents snack when hunger hits at any time of the night. They’re gloopy and disgusting and delicious and deep-fried. It’s the calorie bomb with questionable beef-blend filling that everyone hates to love. Chef Joel Miller celebrates the Southern California creation with his own version at his Culver City restaurant. The playfully named “Tacos de Caja Payaso” are a dead-on recreation: High-quality beef combines with onions and local potatoes to form the inner workings, and each taco even includes the requisite slice of cheese (here, cheddar) and thinly shredded lettuce—not to mention the near-identical hot sauce, which Miller makes in-house. The kicker? 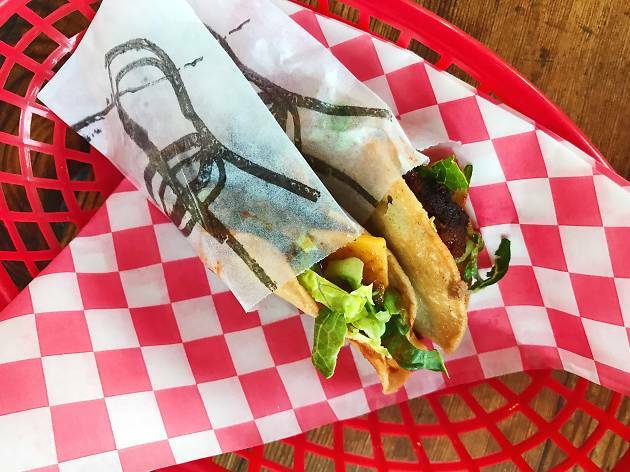 Each taco is served in a paper sleeve, like the originators, but instead of getting stamped with the J-in-the-B logo, they feature the Wallace’s signature upside-down chair. They’re only available during happy hour—held 5:30 to 7pm daily, at the bar—and at $5 for three they’re a little costlier, but may be slightly less costly in terms of the damage to your body. Taco Bell’s strata of ground beef, cheese sauce, lettuce, crunchy tortilla, tomatoes and sour cream (of the reduced-fat variety, LOL) is one of our undisputed late-night go-tos, so it makes sense that its gourmet counterpart launched during Freedman’s late-night service—which was a shame, because we want this pastrami-packed Crunchwrap all the time. Fortunately, there’s additional-hours hope on the horizon. Silver Lake’s modern Jewish deli only served their pastrami Crunchwrap during late-night service on Thursdays from 10:30pm to 2am, and while late-night will most likely be on hold through the holiday season, the Freedman’s team just launched delivery service on Caviar, and they’re putting the pastrami Crunchwrap on the menu as a delivery-only option. All hail this novelty item turned legit with thick slices of lean pastrami subbing in for the seasoned ground beef—if only all Crunchwraps came stuffed with pastrami.